I thought I'd better write something before you all get bored of checking to see if I'd written, and finding - nothing new. 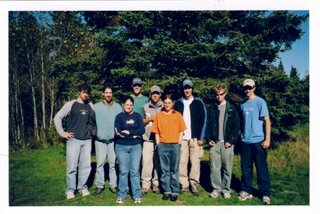 The group shot was taken in Baxter State Park, Maine - my favourite place in the states (the only one I've been to twice). Distracting me from my usually exuberant blogging are two things. The first is school - I'm really trying hard to get everything tidied up and done so I can be a bit less stressed. This is of course hopeless, because whenever I get the stuff with deadlines tidied away - there is a tonne of more esoteric, deadlineless tasks awaiting me - but until then I'm hoping. The other problem, of course, is that facebook is sucking up my internet time in a bad/good way. Its kind of a tease - neat idea, but I'm just old enough that there are a lot of people I'd like track down that simply aren't into this kind of thing. The ones I know well enough to have emails for - well, I'm mostly in contact with them to some extent anyways. But still, I've caught up with a few folks that I'd otherwise lost contact with - making the whole thing worthwhile. Pan's Labyrinth; Oh gosh, what a wonderful/scary/visually amazing movie. I saw it on DVD (Don't ask) on the weekend, and was torn between horror and amazement. What an amazing movie though.